The river Kali doesn't measure up to a Ganga or a Cauvery. But there must be few rivers in the country facing such ecological stress. There are six dams on the Kali to facilitate hydro-electric projects. Virtually Karnataka's powerhouse, producing 1,200 MW of power, it supports the Kaiga nuclear power plant, which produces an additional 440 MW of power. For a river which is so giving, the Kali has, for decades, suffered the injection of toxic effluents from a large paper mill and other industries along its path. And now, there has been talk of a seventh dam on the river. If this happens, experts fear, the Kali will cease to flow. Now, environmentalist Sunderlal Bahuguna—hoping to repeat his Chipko movement of saving trees—has come to Kali's rescue. To inspire people, he undertook a walk along the river's banks. "Only the people can be the voice of rivers like Kali," said Bahuguna. His disciple Panduranga Hegde, who started Appiko—modelled on the Chipko movement—in the Western Ghats, says: "To urge people not to give up the struggle, after the Narmada tragedy, is essential. We believe that only a people's movement can save the Kali." It is owing to this pressure that Karnataka has decided to urge the Centre to extend the National River Conservation Plan to 11 more towns. This will cost the state Rs 169 crore. The Kali originates at Kusavali on the Karnataka-Goa border and flows into the Arabian Sea at Karwar. The six dams have already submerged 32,000 acres of forests in the region. If commissioned, the seventh dam—on hold right now—will submerge 110 more hectares of one the largest evergreen rainforests in the nation. We travelled along the Kali's course, from Dandeli to the estuary in Karwar, to assess the damage and the manner in which the river has impacted the lives of people living along it. As we entered Kariampalli, the villagers, whose sole livelihood is dairy-farming, tell us that a mysterious disease has stuck their livestock. "The healthiest buffalo we purchase with a loan of Rs 15,000, under the PM's Rozgar Yojana, is rendered useless the moment they drink the waters of this village. We then sell it for Rs 1,500 to the slaughterhouse. This has become a regular feature after the production of the paper mill increased. Nearly 40 years ago, our village used to produce 1,000 litres of milk daily, but now we barely produce 30-40 litres. Worse, female buffaloes consuming this water can't conceive. We are destroyed," says Navelu Bhagu Jore, vice-president of the Haliyal taluk panchayat. The water Jore is referring to comes from the Kali and the paper factory is the West Coast Paper Mills Limited, one of India's oldest paper mills and the biggest industrial unit located on Kali's banks. An old charge against this ISO-9001 company has been that it releases untreated, toxic effluents into the river. Besides the paper mill, there is a ferro alloys factory, a plywood factory and other small industries that spew effluents into the river. According to an estimate, the mill releases nearly 64,800 kilolitres of effluents into the river daily. The Peoples' Science Institute at Dehradun, which studied Kali's physiochemical and biological characteristics in 2004 to analyse the effluents' impact, made some startling revelations. It said the daily influx of mercury from the effluents into the river was "around 345 gms/day". Downstream, they found various percentages of mercury concentration in the river and it was highest at the Bomanahalli dam site. "The concentration of toxic metal recorded here was 12 mg/L.... This is a perilous situation...considering the fact that the fishes reared here are sold in Dandeli and other towns," the report warned. In the agricultural fields around Kariampalli, the dilemma faced by farmers becomes clear. "You don't water the crops they die, you water them with Kali's water they die, what do we do?" asks Ananth Kumbhirkar, pointing at his devastated tomato and brinjal crop. "The ground water is polluted, too. There is no point in irrigating your land with water from a borewell or a well," he says. The most shocking fact is that nobody downstream of Dandeli drinks Kali water. A new World Bank Project has been initiated to supply potable water to villages around Dandeli. 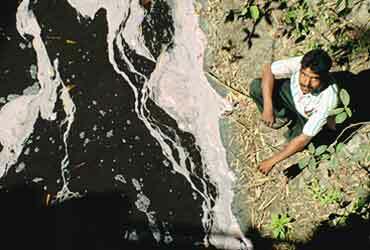 "In some ways, the World Bank is paying for the mill's pollution," says Hegde. Nearly 70 kms from Dandeli, towards Karwar, people use water from Bedthi river. "It is strange that a river that should be the peoples' lifeline is so avoided. It happens nowhere in the world," says N. Chapakand, a resident. Taking note of the air and water pollution caused by the paper mill, the Karnataka State Pollution Control Board (KSPCB) served a closure notice on it four months ago. "But the mill got a stay from the high court. They informed us that they have invested Rs 8 to 9 crore on a treatment plant and have sought permission to start a powerhouse so that they could divert the various gases produced in the boilers to generate power. We will inspect the facility soon," says KSPCB chairman N. Bhoomanand Manay. All efforts by Outlook to secure a comment from the West Coast Paper Mills proved futile. At Kaiga, near the nuclear power plant, folks at Balemane lead an anxious life. They are just 1.5 km from the nuclear plant on the opposite bank of Kali where radiation meters are fixed at various points. The readings on these meters are taken regularly, but the villagers are hardly told what the readings mean. "There is supposed to be no human habitation within a 3 km radius of a nuclear plant, but Balemane is just a stone's throw from it," says Panduranga Hegde. At Karwar, our last stop, V.N. Nayak, a professor of Ocean Sciences with Karnataka University, gives us more alarming facts: "Kali is almost ruined," he says. "The sand and shell mining at the estuary and other places is disastrous. Shells are a rare mineral. The constant encroachment has destroyed marine life," he says. The alarm bells have been ringing for years now. Bahuguna hopes that the people's voice will be heard by the state. In any case, it has little to say in defence of the dams and industries which are pushing the Kali to extinction.